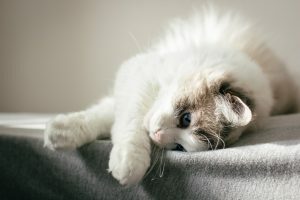 At Cats on Call in Scarborough, Maine, we understand that you and your cat are likely feeling some apprehension at the idea of visiting a clinic. You can count on our cat veterinarians to help your furry friend feel better. We care about your comfort, and we take steps to ensure your pet feels completely at ease in our comfortable facility, no matter the reason for your visit. Dr. Hoyt grew up in Cumberland, Maine. After graduating from Bowdoin College, she conducted cancer research at the Medical School of Bern, Switzerland. She did Masters work in clinical nutrition at University of Illinois before receiving her Doctorate of Veterinary Medicine from the University of Wisconsin in 1990. She initially trained to work with zoo animals at both the San Diego Zoo and Marine World, before completing an internship in small animal surgery and medicine. She has been specializing in cats since 1991. In the summer of 2010, she traveled to Botswana, where she worked in the bush, tracking leopards for the purpose of placing radio collars. She lives at Higgins Beach with her husband, daughter, three cats, and one dog who thinks she is a cat. On November 10, 2008, our four-footed staff member joined us by getting underneath Dr. Hoyt's car at a parking lot near the library. He heard that there was an opening at Cats on Call. It was quickly apparent to us that his skills were great, not only in donating blood, but also in grief counseling. Kahmeer's daily duties as official greeter are very entertaining, not only to our clients, but also to those who deliver mail or live in the neighborhood. His secret desire is to someday be on David Letterman. We invite you all to come meet Kahmeer, see his newest trick, and get one of his famous nose kisses. Meredith's veterinary career began in 1989 while volunteering at the Merced Zoo in California. She changed her major to Veterinary Technology from graphic design, and took a job as a kennel worker and veterinary receptionist. After moving back to her hometown of Cincinnati, she graduated from the University of Cincinnati in 1994. Working as a receptionist, technician, and manager at various hospitals in Cincinnati eventually resulted in her ending up with us in Scarborough in May 2007. 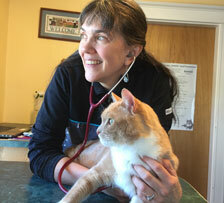 Teri has been in the veterinary field since 1988. She started from the ground up as a high school student with the Co-Op program at Kennebunk High School. Although Teri does not have a formal degree, she makes up for it with her hands on training and firsthand experience. She lives in Southern Maine with her husband, three children, four dogs, eight cats, and a chinchilla. Teri has been with Cats On Call since 2011. We are fortunate to have her as part of our team. Teri is the jack of all trades; she can be found assisting the veterinarian, helping in surgery, going on house calls, helping clients, and grooming our kitty patients. Wendy is our Saturday Assistant who fills in when our regular staff is on vacation. She has many years of work in shelter medicine and raising kitten orphans. She hopes to return to a regular schedule once her two young children are in school. For now, she keeps busy teaching Salsa as well. Click here to find out what this certification is and what it means to you and your feline companion.